Longing for a glowing skin? Did you know the solution was just right there in your kitchen? That golden spice in your cabinet with an excellent aromatic smell that you use as a seasoning or coloring agent in your dish. Yes, saffron is the catch! Obtained from crocus sativus flower, saffron is actually the dry stigma of the flower that is deep red/golden in color and aromatic smell. One of the most expensive spices in the world (by weight), saffron possesses excellent medicinal properties that ensure your better health. Also, the spice is rich in anti-bacterial properties, owing to which, it is often used as a beautifying ingredient. Saffron contains carotenoids, rich antioxidants that impart a number of healing properties to the ingredient, making it ideal for treating skin tumors, improving eye vision & health and arthritis and many more. Additionally, saffron is flooded with more than 150 volatile and aroma-yielding compounds that impart excellent medicinal properties to the spice. Saffron is very helpful in treating Alzheimer’s disease. It is rich in gallic acid and other antioxidants that offer protective benefits against amyloid plaques that build-up in the brain of Alzheimer patients. This helps in providing relief from the disease. According to a 2010 study published in the Journal of Clinical Pharmacy and Therapeutics, saffron is both safe and effective in mild to moderate Alzheimer’s disease. Another 2010 study in the journal Psychopharmacology found that saffron supplementation (30 mg per day) has a therapeutic effect in the treatment of patients with mild-to-moderate Alzheimer’s disease. A 2015 study published in the Journal of Integrative Medicine found reported that in comparison to placebo, saffron was helpful in improving depressive symptoms, premenstrual symptoms, sexual dysfunction and in reducing excessive snacking behavior. Rich in carotenoids, Saffron exhibits exceptional anti-oxidative and anti-inflammatory properties, which ensure proper functioning of heart and improve cardiovascular health. A 2011 study published in The Journal of Tehran Heart Center reported that saffron helps in lowering cholesterol by as much as 50 percent. The study also reported that not only saffron helps in lowering cholesterol but helps in maintaining healthy cholesterol levels in the body. The crocetin content in saffron helps in bringing down levels of cholesterol, lipoprotein and triglycerides in the blood, thereby preventing clogging of arteries. Also, this carotenoid helps in increasing oxygen levels in the body, thus reducing the risks of heart attacks and strokes. Further, antioxidants in saffron help in combating the negative effects of free radicals on the arteries, thus preventing arteriosclerosis, a condition caused by loss of elasticity in the arteries. Additionally, saffron is rich in potassium content, which is again an important mineral required for balancing the blood pressure levels in the body. An effective anti-oxidant, saffron is very helpful in fighting cancerous cells in the body, thus reducing the risk of cancer. Saffron is rich in phytochemicals like crocin and safranal that inhibit the growth of tumors in body. These phytochemicals not only protect the cells from oxidative damages, but also restrict abnormal cell growth or division. The high carotenoid levels in saffron can prevent several cancers in ovaries, liver, colon or blood. Further, the cancer preventive ability of saffron includes prevention of chemical modifications in DNA that activates cancerous genes and controlling promotion of tumors. In addition to this, saffron provides protection against harmful effects of chemotherapy drugs. A 2014 study in Pharmacognosy Research journal found that consumption of saffron correlated with a reduced risk of many type of cancers. The study also revealed that carotenoids in saffron were the most medicinally bioactive and exhibited activities like antioxidants, modulating gene expression, affecting cell growth regulation and regulating immune response. A 2016 study published in the Journal of Functional Foods reported that saffron is not only a direct antioxidant agent in the body but also acts as a modulator on human vascular endothelial cells (HUVECs) under stress conditions. Thus, saffron helps in improving cell survival and provides a therapeutic approach in the prevention and treatment of oxidative stress mediated diseases. According to a 2013 study in Journal of Integrative Medicine, saffron supplementation can actually improve mood and reduce signs of major depressive disorders compared to placebo control. Saffron aids in the production of serotonin (neurotransmitter), which helps in maintaining mood balance in the body. Further, saffron also contain safranal (volatile oil), which works as an effective anti-depressant. Safranal modulates the secretion of serotonin and noradrenaline that are responsible for regulating body’s reaction to stressful circumstances. Regular consumption of saffron can help in maintaining serotonin levels in the body, thus balancing mood swings and fighting anxiety and depression. Another 2005 study published in Phytotherapy Research found that 30 mgs of saffron (powdered or capsule) proved effective in the treatment of mild to moderate depression. A 2016 study published in the Molecules journal asserted that corcus sativus (saffron) and its components are a promising class of compounds for the treatment of anxiety disorders and schizophrenia. 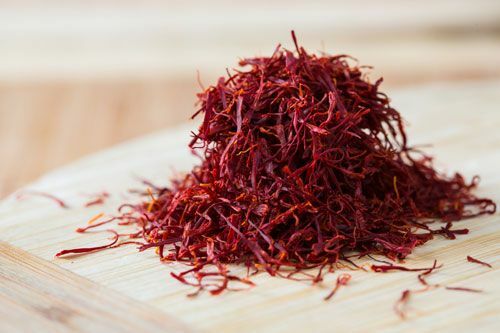 According to a 2008 study in Journal of Investigative Ophthalmology & Visual Science, saffron protects photoreceptors from retinal stress, balancing both morphology and function and regulating programmed cell death. Additionally, it protects the retina against oxidative damage. Rich in carotenoids, saffron when consumed regularly helps in maintaining healthy vision and improves sight. It protects the photoreceptors (vision cells) from damage by affecting genes that help in maintaining the levels of fatty acids in the cell membranes, thus making eyes stronger and the vision cells tougher. Plus, saffron helps in slowing down and even reversing the course of blinding diseases like retinitis pigmentosa and other age-related macular degeneration. Additionally, saffron helps in protecting the eyes from the harmful radiations from sun. A 2016 study published in the Italian Journal of Medicine studied 54 participants with dry age-related macular degeneration (ARMD). 29 participants were given 50 mg serving of saffron daily, while 25 subjects were monitored as the control group. After a 3 month period, the study reported a significant increase in visual acuity and contrast sensitivity in subjects in the saffron group. Thus, the study concluded that short-term consumption of saffron, in patients with dry ARMD, is helpful in slowing down molecular degeneration and improves visual function, especially contrast sensitivity. 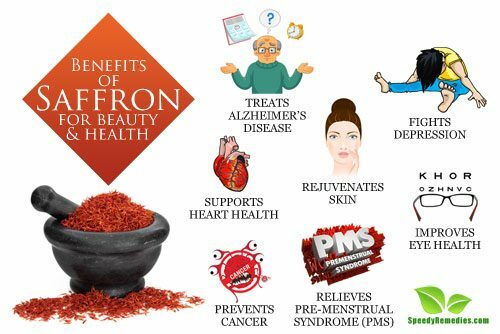 Saffron is a storehouse of crocin, a non-volatile oil, which is extremely helpful in protecting the brain cells from age-related degeneration. Crocin also has anti-amyloidogenic properties, which helps in treating mental impairments and memory loss. In addition to this, saffron contains crocetin, which is again effective in reducing inflammation in the brain cells. Crocetin helps in treating conditions like loss of memory and Parkinson’s and also enhancing memory and intellectual processing. A 2011 study published in the Phytotherapy Research journal suggested that crocin and saffron extracts help in improving spatial cognitive abilities following chronic cerebral hypoperfusion in the humans. Another recent study in 2016 published in the African Journal of Traditional, Complementary & Alternative Medicines confirms the effectiveness of crocus sativus (saffron) in improving memory and learning ability. PMS is a group of recurring psychological, emotional, physical and mood discomfort conditions that occurs in women after ovulation or before the onset of menstrual period. According to a 2015 study published in the Drug Research journal found saffron to be relieving with the symptoms of PMS. The study was conducted on women between 20-45 years of age, with regular menstrual cycles and experience of PMS symptoms. These women were randomly assigned to receive saffron capsules 30 mg per day (15ms twice a day). The result was a significant difference in the efficacy of saffron in cycles 3 and 4 in the total premenstrual daily symptoms. Another 2016 study published in the European Journal of Integrative Medicine monitored 78 students over a period of two menstrual cycles and asserted that saffron is helpful in reducing the severity of PMS symptoms. Along with this, saffron also helps in reducing chronic bleeding in the uterus. So women with such problems can consume saffron in small amounts. Widely acknowledged for its anti-bacterial properties, saffron is extremely beneficial for treating acne and can directly be applied to the affected area. It acts as a natural scrub and helps in removing dead cells from the skin. Saffron serves as an effective agent in toning and purifying your skin. It helps in unclogging the clogged pores in the skin, thereby removing blackheads. Also, saffron hunts down free radicals in the body and ensures their smooth circulation to the face, thereby securing a smoother and firm skin. Soak a few strands of saffron in rose water. Use the mixture regularly for an even-toned, rejuvenated and fairer skin. One of the best attributes of saffron is its skin lightening property. This helps in getting a glowing, radiant and fairer skin. This is one reason saffron is one of the major constituents in most beauty creams. A 2014 study published in the Tropical Journal of Pharmaceutical Research asserted that the antioxidant activity of saffron extracts on the skin was 81 percent. The study highlighted that creams containing saffron extracts in the formulation produced significant depigmentation and anti erythemic effect on human skin. Also, as a nourishing and purifying agent, it helps create a clear and flawless skin. Take 2-3 strands of saffron in a bowl. Add 2 tablespoon milk in it. Allow the saffron strands to infuse in the milk for 5 minutes. Add 1 teaspoon sandalwood powder in it. Mix them to form a paste. Follow this regularly for a week for a glowing skin. Take 3 to 4 strands of saffron in a bowl. Pour 3 teaspoons of hot water over it. Cover this with a lid. Crush the strands well with your fingers to extract the solution. Add one half tablespoon honey to this. Apply this mixture to clean face. Wash off using normal water. Do not use soap for next 5 to 6 hours. Not only is saffron rich in anti-oxidants, but also possesses healing and anti-bacterial properties. This makes it one of the most effective ingredients for getting rid of acne, pimples and scars on your skin. Also, saffron has excellent exfoliating properties, which helps in easy removal of scars and the spots & blemishes left behind from these scars. Add one half cup milk to this. Let it soak for about 2 hours. Repeat the process 3-4 times a week for acne-free skin. Take 10 to 12 strands of saffron. Add 5 to 6 basil leaves to this. Apply the mixture on pimples and acne. Leave for about an hour. Follow this remedy twice a week for reduced acne and pimples. Rich in phytochemicals and anti-oxidants, saffron proves an effective ingredient for the treatment of baldness (alopecia). Saffron when applied over the scalp, repairs hair follicles, thereby preventing hair loss and encouraging growth. Take one cup milk in a bowl. Add 6 to 7 strands of saffron in it. Soak for about 10 minutes. Add 4 to 5 tablespoon licorice powder to this. Apply this over the scalp and hair. Take one half cup (approx 150 ml) olive or almond oil in a pan. Add 1 teaspoon powdered saffron to this. Heat the mixture on low flame for 5 to 7 minutes. Remove from heat and allow it to cool at room temperature. Pour it in a bottle to store. Use if after 3 to 4 days (allows the beneficial ingredients in saffron to infuse with the oil). Apply over patchy scalp for improved growth. Pregnant women are advised not to use saffron as it has strong effects on reproductive system. So in order to avoid miscarriage during early pregnancy, it is recommended to consult a gynecologist before use. Saffron should be consumed in very small quantity, as the spice is extremely powerful even in meager amounts. Not more than 3 gm should be consumed in a month as this may negatively affect the kidneys due to high crocin levels in it. Due to its high prices, there are many adulterated or fake products available in the market. You can determine if the saffron you bought is fake or genuine by immersing a small amount in warm water or milk. If the liquid colors instantly, your product is fake because genuine saffron when soaked, takes at least 10 – 15 minutes to spread its aroma and deep red gold color. The Journal of Tehran Heart Center: Cardiovascular effects of saffron: an evidence-based review. Journal of Integrative Medicine: Saffron (Crocus sativus L.) and major depressive disorder: a meta-analysis of randomized clinical trials. Phytotherapy Research Journal: Crocus sativus L. in the treatment of mild to moderate depression: a double-blind, randomized and placebo-controlled trial. African Journal of Traditional, Complementary & Alternative Medicines: MEDICINAL HERBS IN IRANIAN TRADITIONAL MEDICINE FOR LEARNING AND MEMORY.